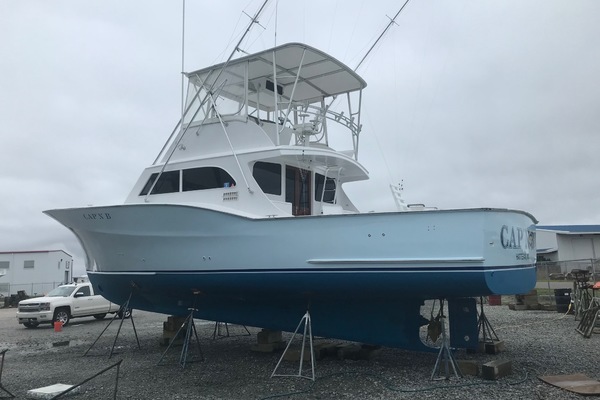 United Yacht Sales New Jersey would love to guide you through a personal showing of this 53' Ocean Sportfish 1997. This yacht for sale is located in Salisbury, Maryland and priced at $189,900. For a showing please contact us by filling out the form on this page and we will get back to you shortly! To starboard when landing below is a pair of comfortable bunks and locker. Just ahead of the bunks is tha shared Head and shower. In the bow you will find the master with make up vanity,Samsung TV and DVD. There are 3 hanging lockers, the head has teak and holly soles and corian counter. To port is a double with Samsung TV and hanging locker.